I got off to a bad start with this towel. I ripped out the border and started over at least three times. Each time I fixed an error I made a new mistake. And if that wasn’t enough, all the undoing weakened two warp ends, causing them to break. Ugh. Time to walk away and come back later. Weaving error is revealed when I snap a pic for Instagram. 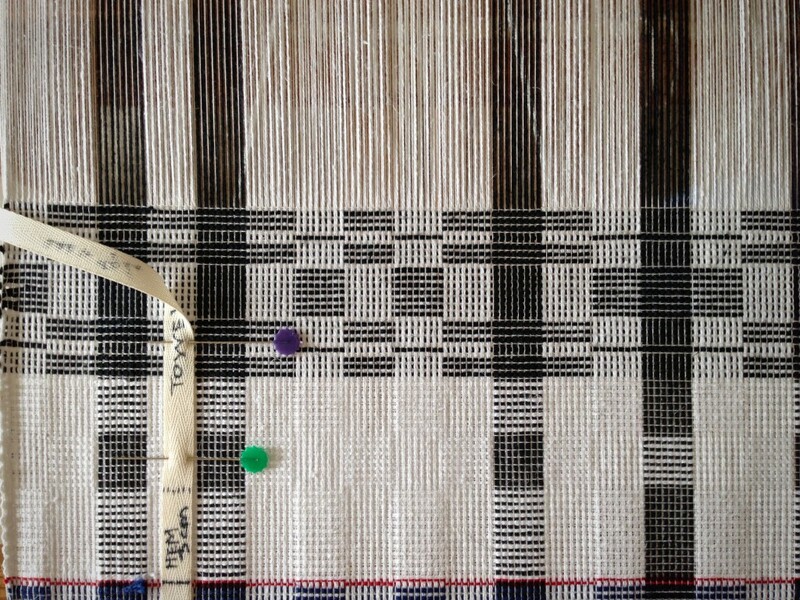 White weft picks are out of order in the center of the weft border stripes. After removing the first error, and weaving a re-designed border, I discover another mistake. Using ultra caution in good lighting, I clip the wefts between the center warp ends back to the error. 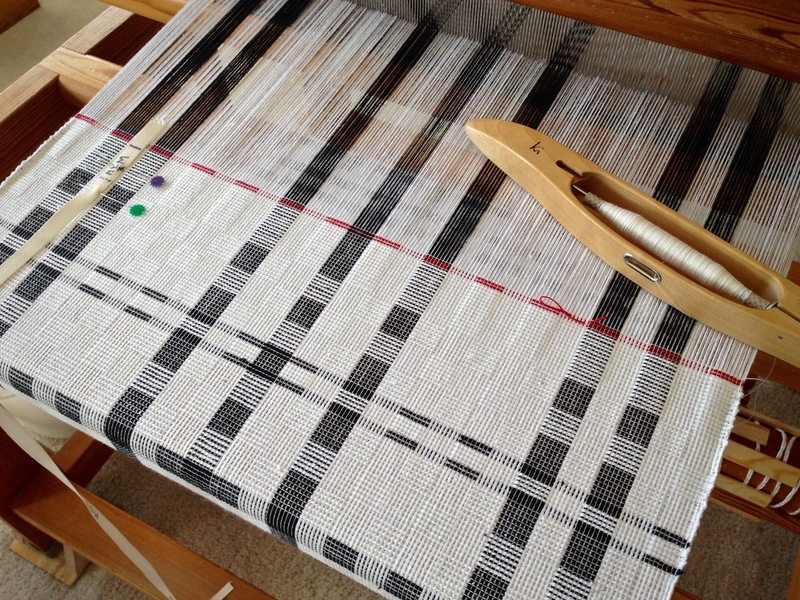 Then, I carefully pull out each cut weft. And try, try again. I believe in persistence, but we need to recognize when to give up and stop trying so hard. Could my own insistence on progress get in the way of progress? Yes. Coming back rested, with unclenched hands, I found myself able to complete the task with ease. Where did all the difficulty go? When I insist on my own way to overcome hardships in life, I don’t get very far. My frustrations blind me to my own errors. Relief comes when I acknowledge the limits of my efforts and put my trust in someone greater. The Lord multiplies what we put in his hands. Jesus once fed a crowd with the bread and fish from one person’s lunch basket. He starts with what we give him; and he increases it. As a result, when we come back to face the hardship, much to our surprise, we find our hands able. May you know when to walk away and start over. I really appreciate that, Loyanne! That means a lot. I dream of doing four-shaft tapestry with rosepath threading on my floor loom. I’m not there yet. It is an ambitious goal. I am inching my way toward that goal by facing little problems on my tiny frame loom and working out solutions as I go. Learning to follow a cartoon is part of the process. Little girl is being woven from the back, one row across at a time. 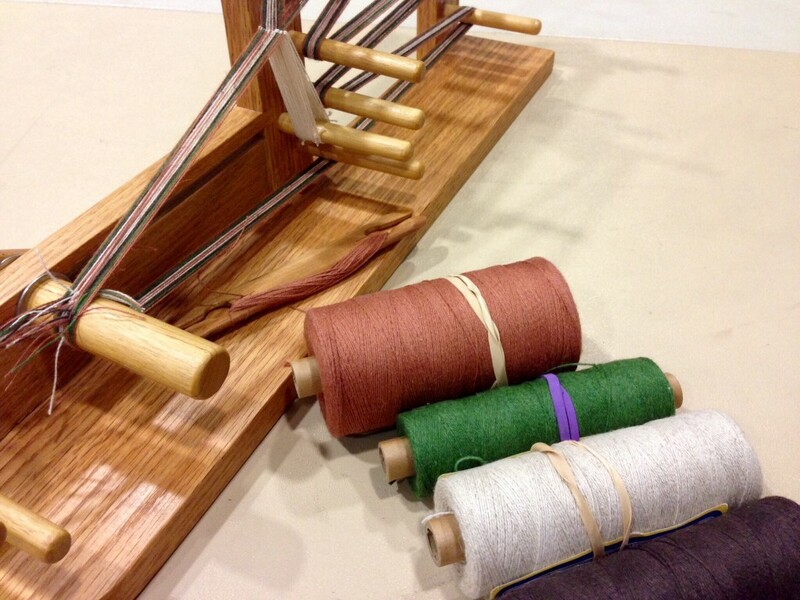 The weft is Borgs Fåro wool, a single-ply that packs together nicely for tapestry weaving. I derived the cartoon for this tapestry from a picture in a children’s book. 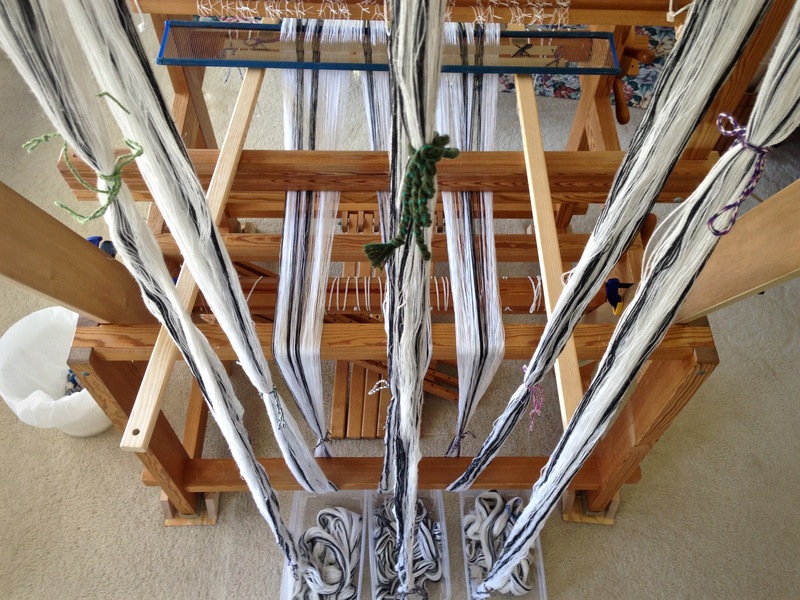 The cartoon, held in place behind the warp threads, is my constant guide. As I make ongoing judgments about colors and other details, the cartoon keeps me on course and shows me the desired outcome. Life is full of choices. If I purposely align myself with integrity, like a tapestry weaver following a cartoon, I have a guideline for decisions. But if I carelessly keep things in my path that tempt me, it’s like covering up parts of the cartoon with random post-it notes. The picture gets obscured. Our surroundings can set the stage for making good choices. And one good choice leads to another good choice. That’s the beauty of practicing with small things. When the time comes for four-shaft tapestry, I’ll be ready. May you flourish in your surroundings. maybe inking the warp is the way to go? put the cartoon behind the warp and ink the cartoon lines on to the warp. Mikala Sidor, studied in Paris at Goblan (sp) tapestry and that’s what she learned and taught her students to do. It was very successful for us all. 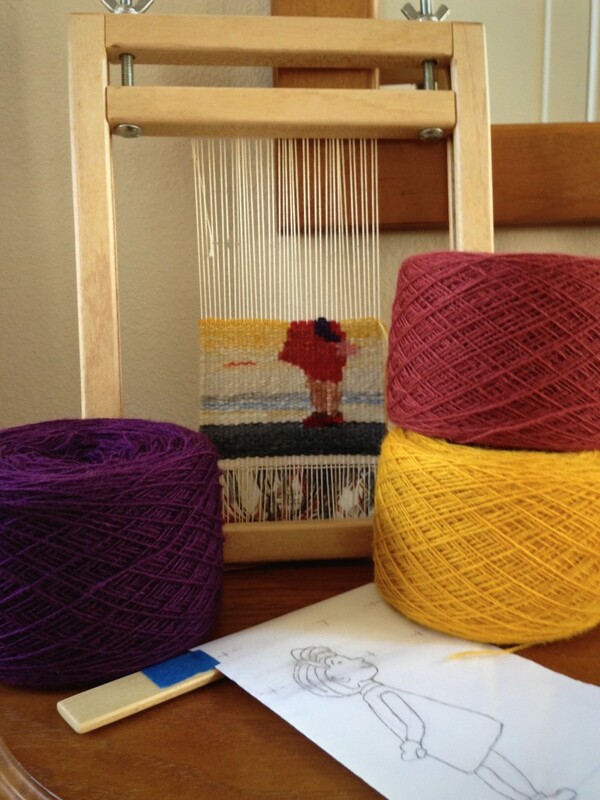 The cartoon stayed out of the way when weaving. I didn’t show it here, but I also ink the warp. 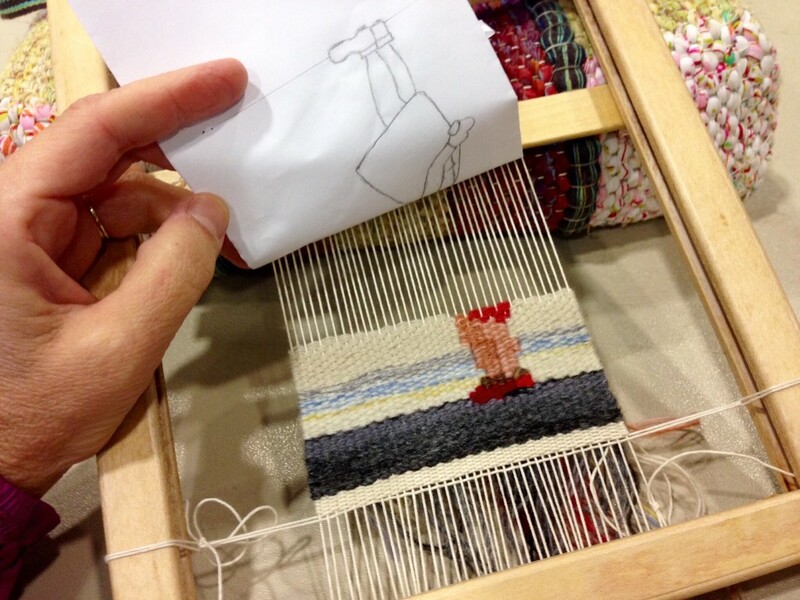 When I’m weaving, the cartoon is held in place at the top, but the paper hangs down loose. Because the warp is so short, the cartoon does get in my way sometimes. A vote of confidence from someone you look up to can make a world of difference. When I saw Joanne Hall’s exquisite towel made with thick and thin threads, I asked her, “Do you think I can weave something like that?” “Of course you can;” she replied without hesitation, “it’s plain weave.” Keep in mind that I was a complete novice on the floor loom; and I barely knew how to handle one shuttle, much less two! I plunged into the ambitious project and came out with a winner! The blue and cream towel hangs on the oven door in my kitchen as a daily reminder of the powerful impact of an encouraging word. Thank you, Joanne! First thick and thin towel, completed as a beginning weaver. This is one of Erica de Ruiter’s designs, found in “The Best of Weaver’s Thick’n Thin,” Edited by Madelyn van der Hoogt. Thick and thin is just as fascinating this time around. It is delightful to revisit a rewarding experience. Who knew that plain weave could be this much fun? 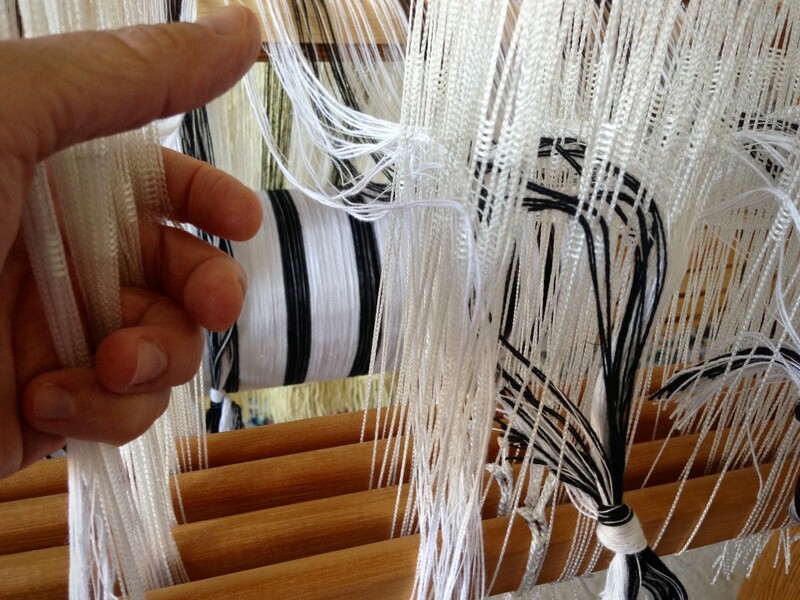 Zebra warp with thick and thin threads on my new Glimakra warping reel. One of three bouts, 10 1/2 meters. View from the crossbar at the top of the warping trapeze, looking down. Ready to untie choke ties and add weights to the warp bouts. Thick ends alternate with thin ends as the heddles are threaded. Left hand separates the shafts‘ heddles for ease of threading. 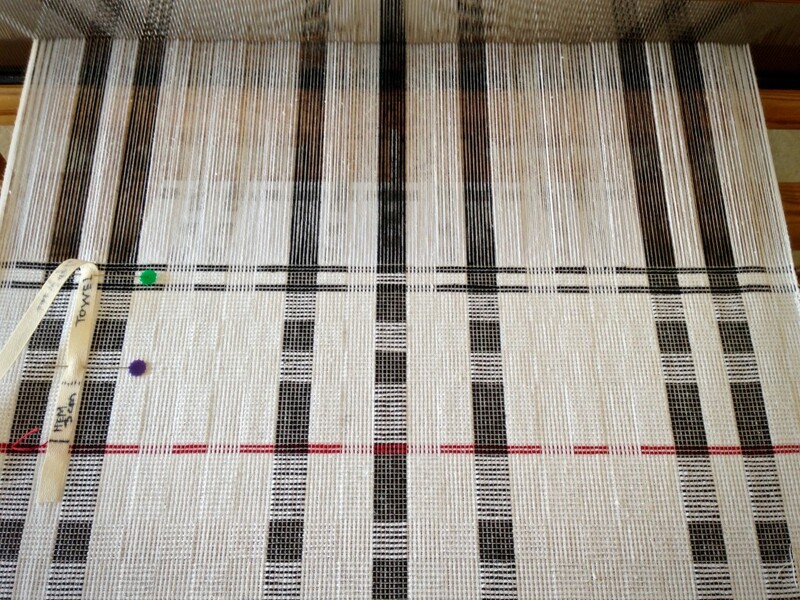 Weaving begins as soon as the warp is tied on and the leveling string is secured. I use the first few inches to check the threading and sett, and to do some sampling. First border is captured with my iPhone camera so that I can easily reproduce the pattern at the other end of the towel. 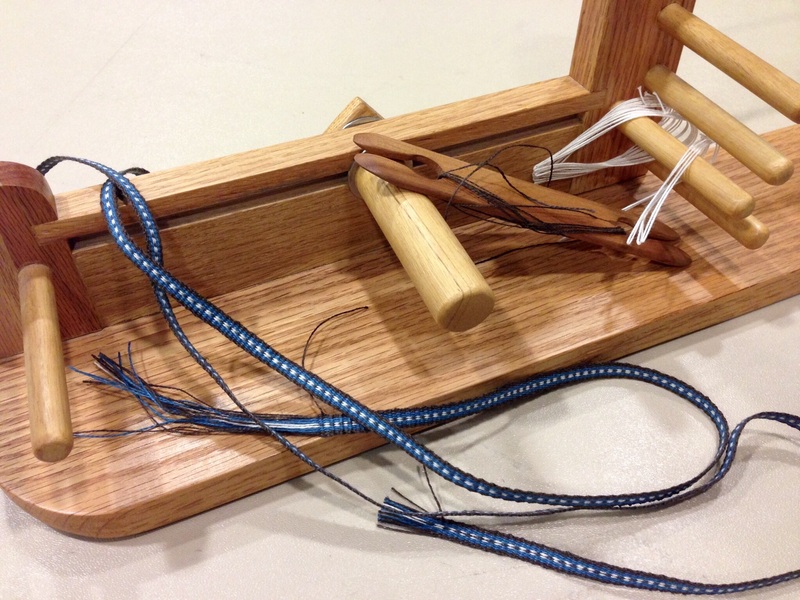 I added a second double bobbin shuttle to make it easier and quicker to switch weft colors. Plain weave gets even more interesting with three shuttles! End of the third towel. View from under the breast beam. I love to see the fabric rolled up on the cloth beam. 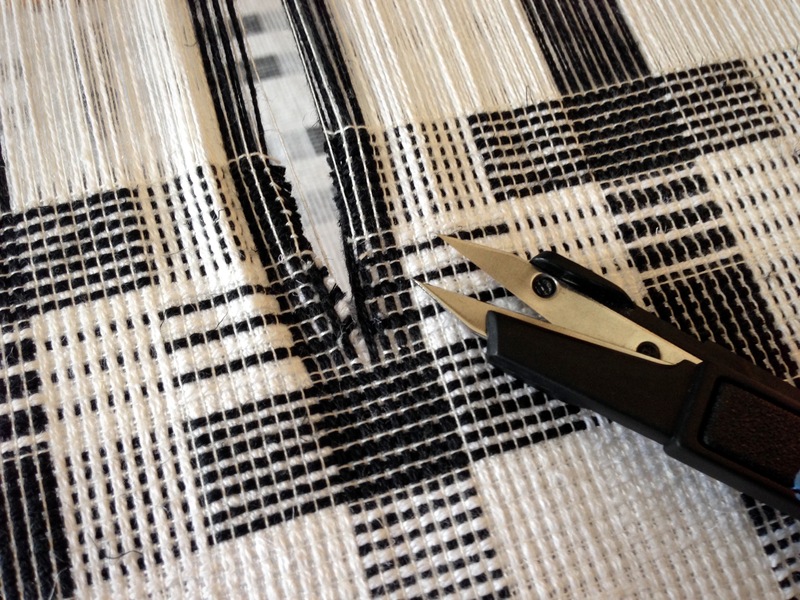 Temple keeps the fabric at the optimum width for weaving. Red cutting line serves as the separation between the end of one towel and the beginning of the next. Ready to start another fascinating pattern. May you give a vote of confidence to someone who needs it. Who would have thought black and white would look so interesting. I would like to see all the different towels when they are finished. Thanks for sharing. Something else to add to my list. Betsy, I’ve been surprised by black and white myself. Turns out it is more fascinating than I thought it would be! PS. I’m going to Vavstuga in February. Fantastic! You’re sure to have a rich experience! I really enjoy your blog and these towels are fascinating. I see one white thread is a “ladder” thread? Can you tell me the brands, sizes of your warp? I won’t copy and sell I promise. Thank you very much. I’m thrilled that you enjoy what you see and read here! Thanks for keepin’ comin’ back! 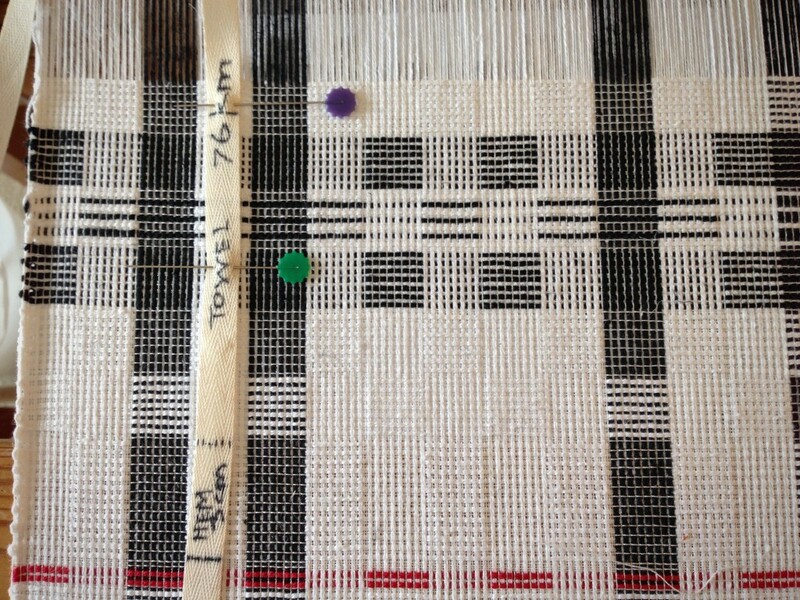 The warp and the weft are the same: Bockens 22/2 Nialin (cottolin, cotton/linen blend), used doubled, in bleached and in black; and Bockens 30/2 Cotton, in bleached. I ordered mine from GlimakraUSA.com, but there are many good USA suppliers of Bockens’ threads. 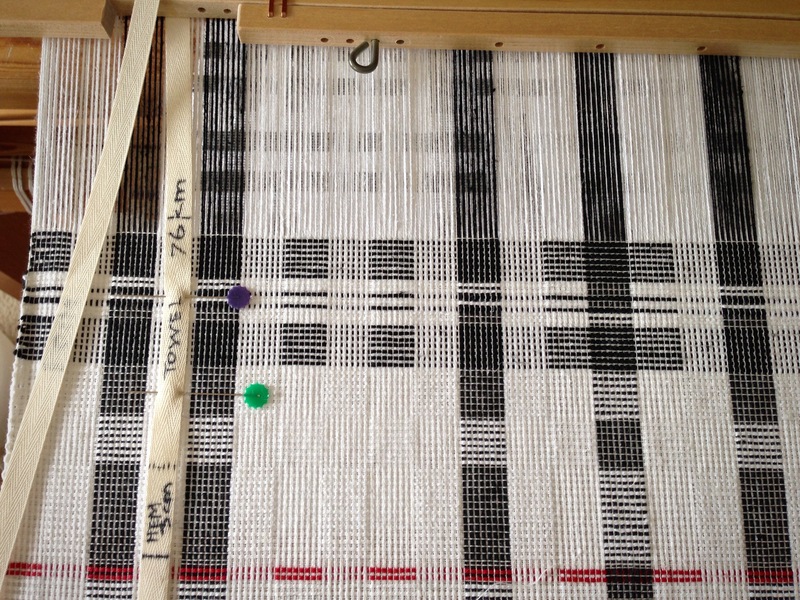 Hi Linda, I have not used color for the weft…yet. But I’m far from finished. After the fourth towel, you will see me play with bits of weft color. It’s going to be fun! I hope you get some good rest in the coming days. i really enjoy your blog. what setts did you use for the different size warp threads? Hi Maggie, It’s great to have you here! This sett is 24 epi, with doubled thick ends and single thin end per dent. Absolutely stunning towels! I wish I had seen this blog a few years ago, I could have purchased one of them. Interesting read, so much information. Thanks! Hi Marjo, Thank you! Im glad you like the towels. They were enjoyable to weave, and I learned so much by doing them. Who knew you could do so much with black and white? The pattern for this third black and white towel differs from the first two. Each new towel is an opportunity to create a new pattern. Two red picks mark the end of towel #2. I always use red for the cutting line between pieces to prevent accidentally cutting at the wrong spot. 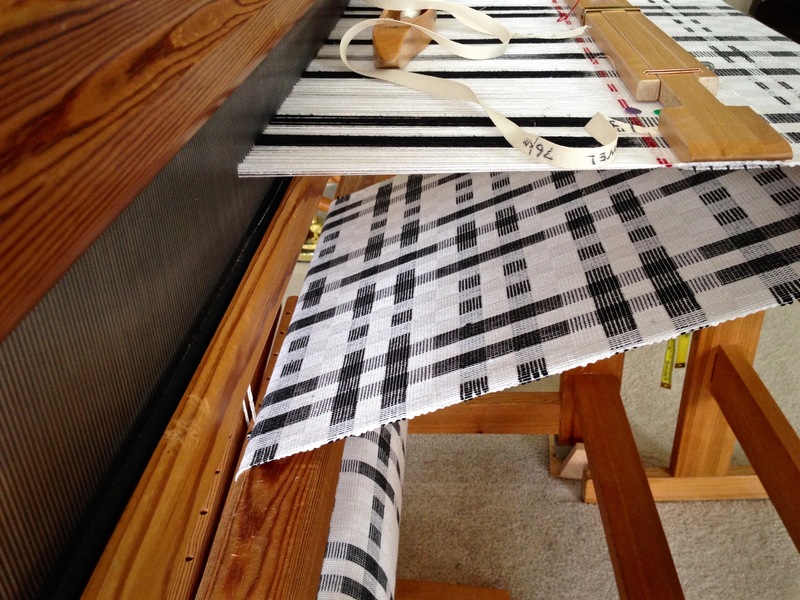 For the first four towels I am putting myself to the test, using only black and white weft. The color restriction turns out to be a designer’s advantage. It forces me to consider possibilities that I might have overlooked if I had allowed myself to include other colors. 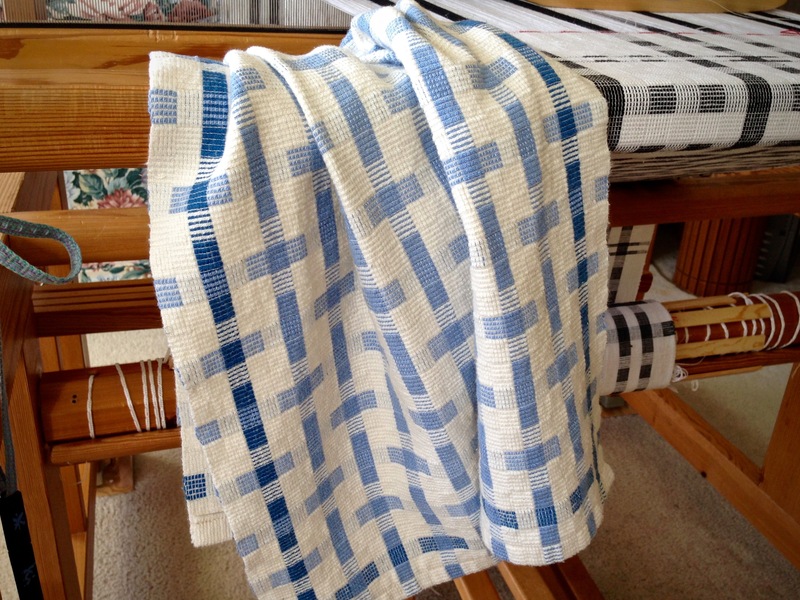 I get excited when I see ideas turn into cloth on the loom. It is still as delightful as it was the very first time I threw a shuttle. If you are a weaver, you know what I mean. Here is an amazing thought: You can bring delight to God. It brings delight to the Lord when we trust in him completely. He knows the right plans, and knows when to stick with black and white, and when to throw in a splash of color. Think of his delight when we go along with his ideas, and the resulting woven cloth of our lives brings a smile to his face. May your ideas turn into delightful cloth. My smartphone keeps bringing up your blog as something I might enjoy and I really have been, thank you for sharing. I was wondering, in the picture you have a strip of paper pinned to you towel. Is that to measure the towel as you go so they are all the same length? What a clever idea! There is always something to learn or inspire when I read your blog. Thanks again. Hi Leigh, I’m pleased that your smartphone sent you here! What you see in the picture is a length of twill tape/ribbon. And yes, it is for keeping the towels a consistent length. I mark the hems on the tape, and I put a mark at the midway point, so I can adjust The tape with the design when I reach the middle, if needed. Thanks for dropping in and saying Hi! Inspiring – on many levels. Donna, I’m so glad you have been inspired here! I look forward to reading your message every time your email appears in my in box. Thank you. Thank you, thank you, Anne. Your sentiments are a sweet gift to me today. are those towels rep weave? 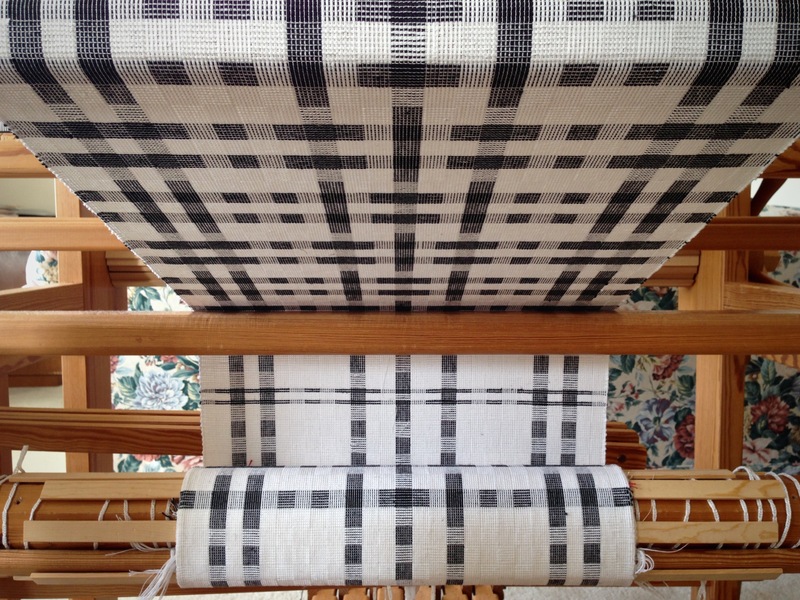 Hi Maggie, This is two-treadle plain weave, like most rep weave, but it is not rep weave. There are similarities, though, in that both use thick and thin wefts. 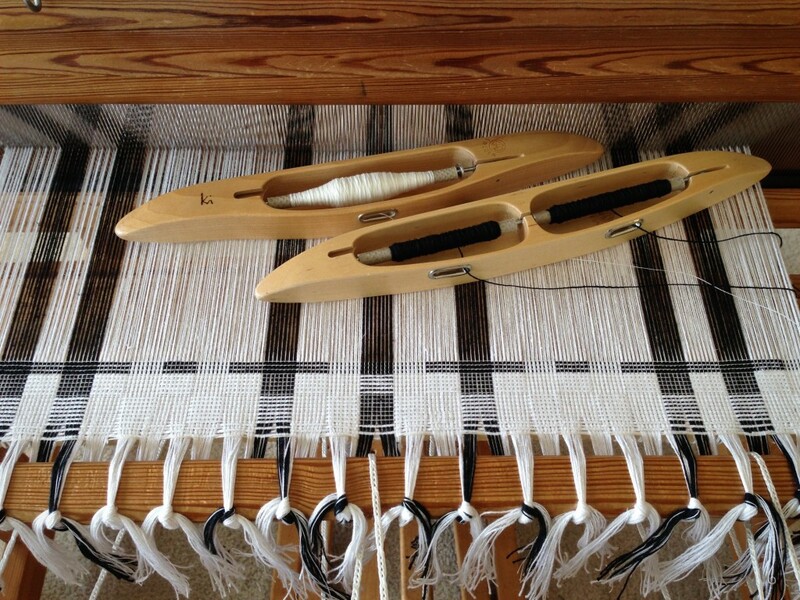 This set up for these towels, however, also has thick and thin warp ends, which gives it another dimension; whereas rep weave, as far as I know, uses all one thickness of thread for the warp, and is normally sett with the threads close together. This “thick and thin” structure produces very flexible cloth, at least with the sizes of thread that I’m using – doubled 22/2 cottolin for the thick, and single 30/2 cotton for the thin. Thanks for asking! And thanks for the encouraging words, too! What do you do when you are away from your looms for a week? Portable weaving, of course. I thought about bringing my band loom, but fitting the band loom in the car turned out to be more of a hassle than it is worth. So the band loom stayed home. 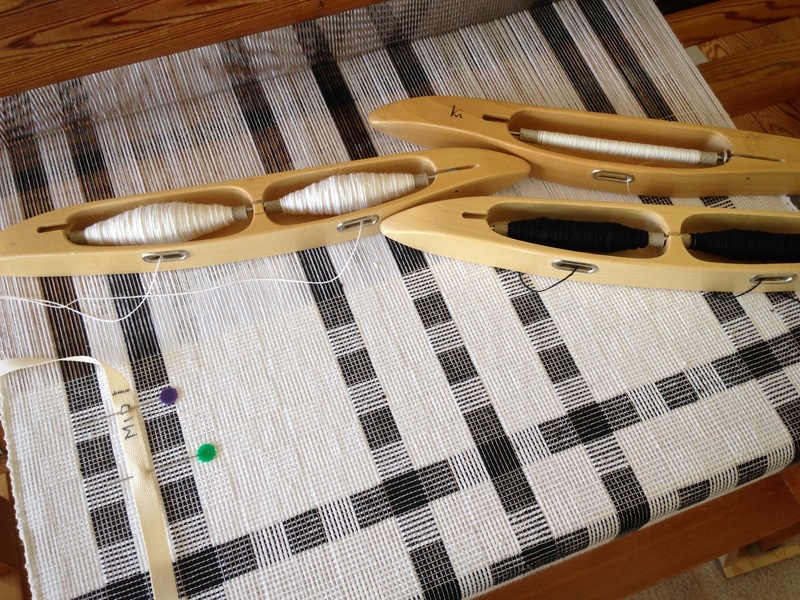 I have my inkle loom with me instead, as well as my small tapestry frame. 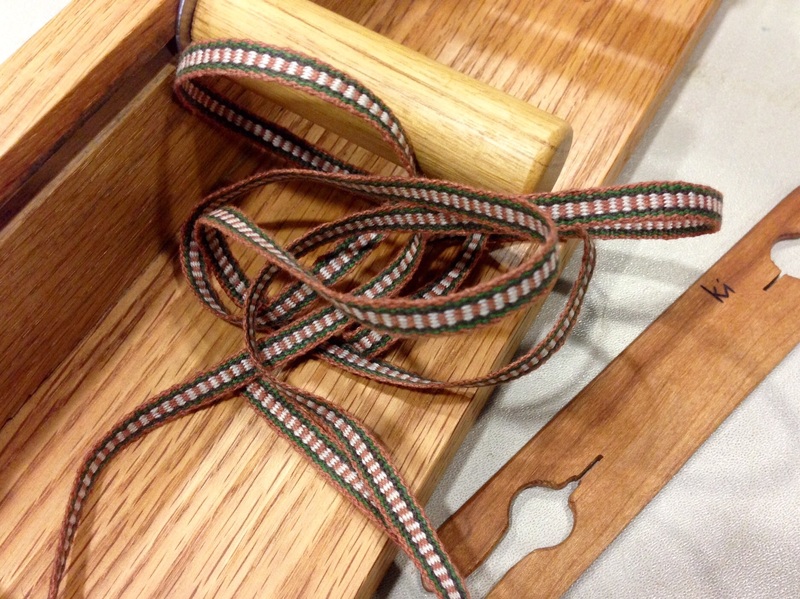 Steve is taking a woodcarving class from Dylan Goodson this week at the Texas Woodcarvers Guild Seminar; and while he is in class I am keeping my hands busy with portable weaving. 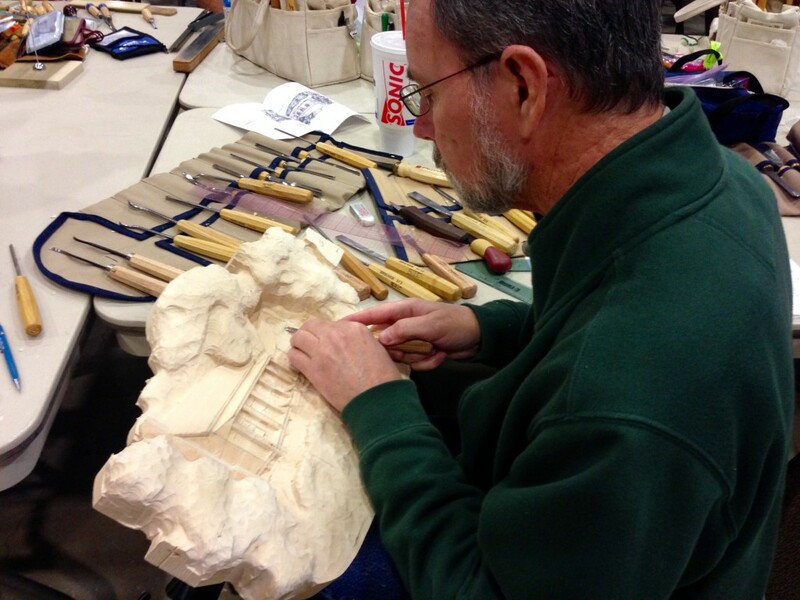 Steve beginning to shape his relief carving, following the finished example by his instructor, Dylan Goodson. 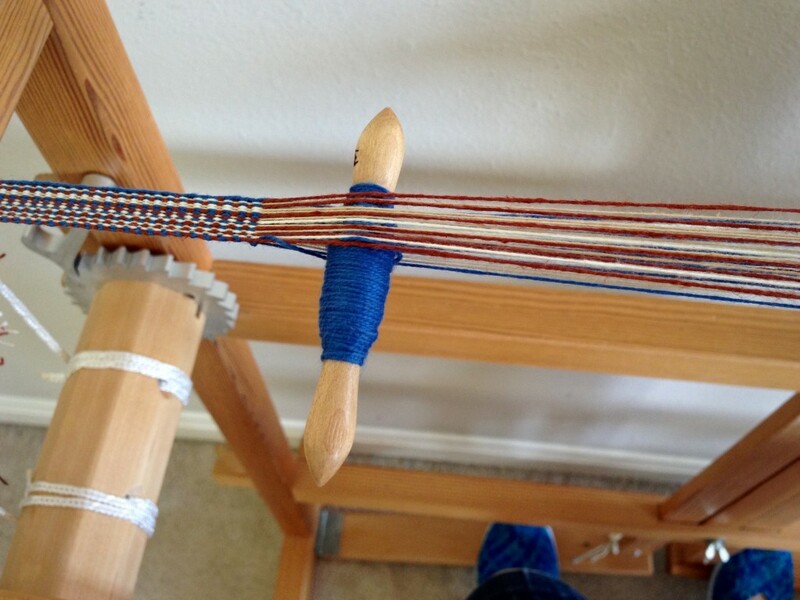 First inkle band of the week is linen. Cottolin warp for the second narrow inkle band. Second inkle band almost finished. Start of a small tapestry of a little girl, derived from a picture in a children’s book. 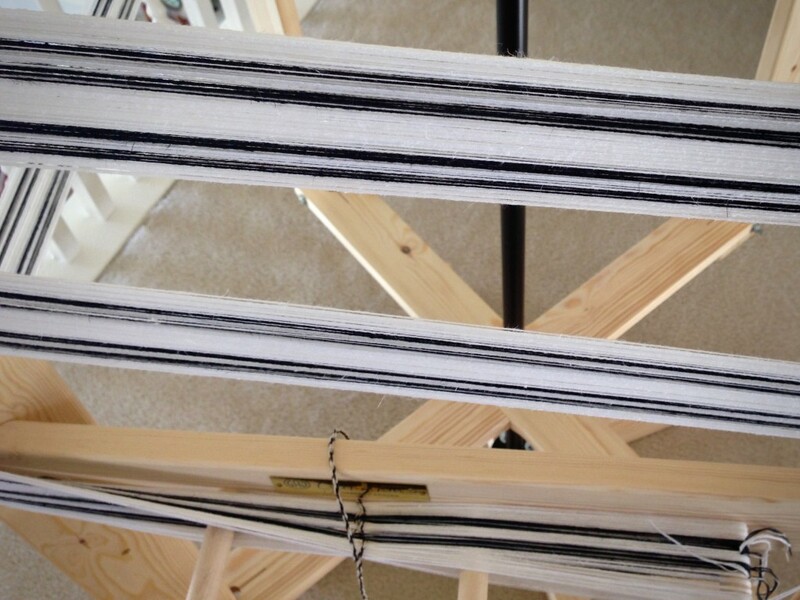 Time to put on one more inkle warp! Adding more details to the relief carving. 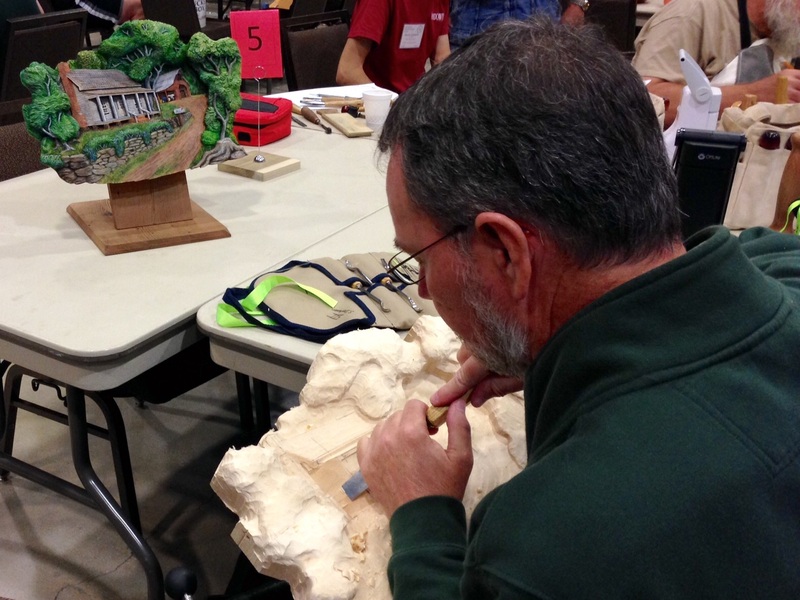 Good carving takes time and patience. Like weaving. May you enjoy passing the time away. Hi Linda, I did make new friends; the social interaction was fun. Several of the ladies had crochet projects with them. The portable looms I brought were great conversation starters. 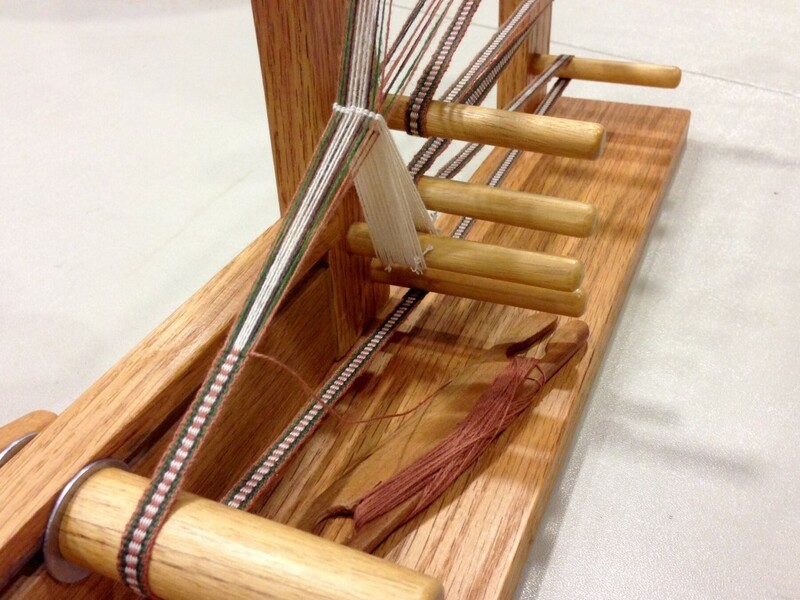 A few people knew what an inkle loom was, but most had never seen one before. Your bands are lovely, Karen! I’m sure you had a lot of interest with you inkle loom. People are used to seeing knitting and crochet done in public, but bring out a loom or spindle and the questions fly! Isn’t it fun? You’re right, Kris, the inkle loom did generate a lot of interest. It was fun to answer questions and demonstrate!